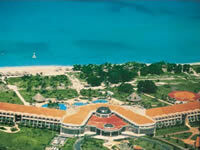 Brisas del Caribe is one of the best destinations in Varadero, the most touristic place in Cuba. The hotel is complete in services: bars, swimming pools, restaurants, and excellent comfort. The main building is surrounded by beautiful gardens, a few meters away from the beach with crystal clear waters, ideal for couples and honeymooners. The staff is always smiling and inviting clients to participate in collective activities, providing a climate of warmness and friendship.